A new study found that common baby items are dirtier than a pet’s water bowl. Here's how to keep the biggest offenders clean. Infants and toddlers, so wonderful and adorable, are alas, total magnets for germs. They touch everything. They put their hands in their mouths (and other things) and then they touch everything again. Of course they can’t yet master good hand hygiene on their own, so parents and caretakers are always on high alert, constantly cleaning up, wiping down and doing whatever else they can to minimize their babies’ chances of encountering infectious bacteria. 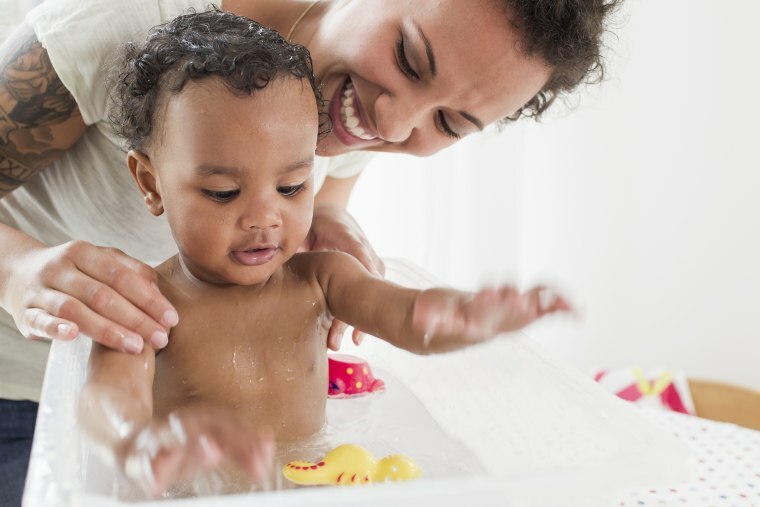 But when you’re juggling children and other family and likely work — it’s really challenging to manage your baby’s hygiene along with virtually everything they come into contact with. There’s only so much you can do; and that’s okay, because kids are going to be exposed to germs no matter how pristine your household. Still, Dr. Platt emphasizes, it’s important to keep everything as clean as you can to minimize unnecessary exposure to bacteria, which could prompt infection (though Platt says it’s almost impossible to determine when infections are the direct result of contact with everyday germs). Here’s a list of the items you should be focusing on along with expert tips on how and when to clean them. A new study by InsuranceQuotes.com tested (using gram and stain culture swab tests) common baby items (a bath toy, a teething toy, a stroller handle and a public diaper changing station) to learn what tended to be the germiest. Bath toys blew everything else out of the water, containing over 4.3 million colony-forming units (CFU) per square inch. Bath toys blew everything else out of the water, containing over 4.3 million colony-forming units (CFU) per square inch. Also in and out of our kids’ mouths all day, sippy cups should be cleaned with care. Johnson’s underscored pro-tip for wooden toys: Do not soak or submerge them in water. Wood is porous and that water absorption can potentially harvest mold. Do not soak or submerge [wood toys] in water. Wood is porous and that water absorption can potentially harvest mold. You should also take precautions to guard against allergens in the bedding. InsuranceQuote’s study found that the average stroller handles contain 1,418,818 CFU, ranking them third germiest of the four objects tested. On the go? Johnson suggests baby wipes for a quick scrub down. Surprisingly, public diaper changing stations were the least germy of the four objects tested. Surprisingly, public diaper changing stations were the least germy of the four objects tested in the study (maybe because we’re already vigilantly wiping them down). Keep up the habit, and clean these with antibacterial wipes per Dr. Platt’s recommendation, before and after use. You’ll also want to keep those diaper bins in tiptop hygienic condition. Dr. Platt strongly recommends keeping antibacterial wipes on you at all times, adding that you should use these to wipe down any area your child may come into contact with while traveling. For convertible car seats, Johnson suggests baby wipes or a spray bottle filled with a combination of water and distilled white vinegar. Keep this and a microfiber cloth to wipe in the car and you’re good to go.